We are sure that the Big B household is going to be celebrating with a lot of pomp as the lady of the house is celebrating her birthday today! Jaya Bachchan no doubt holds a soft corner in many people’s heart. No doubt she is also one of the finest actress in the country. Jayabachchan was first seen in the movie Mahanagar in the year 1963. 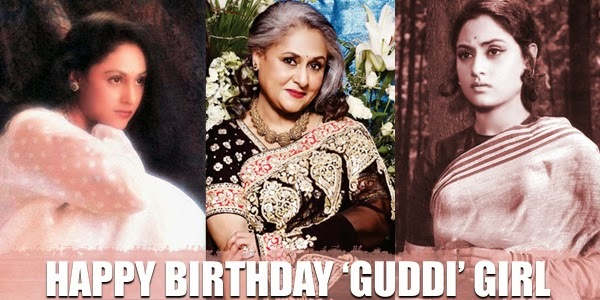 But the movie that actuallu gave her a break was her second film titled Guddi for which she was widely appreciated for her perfect portrayal of the character.She was also nominated for the Filmfare best actress for this film. Thanks to Bansi Birju which brought her together with her future husband, the chemistry began blossoming to a beautiful marriage. If one has to name a path breaking movie of her career it would ofcourse be Sholay which bossted her career path. The actress who will turn 66 this year, we can say has definitely been through the ups and downs in her life. As a dutiful wife, she has always been with AmitabhBachchan throughout. And needless to say, she has also fulfilled her duty or rather the role of a mother with ease. JayaBachchan we could say is one of the heroines who keeps herself away from all the politics of the industry. Not many are aware that Jaya Bacchan has infact received about 9 Filmfare awards as the best actress. Also a winner of the Padma Shri award that was given to her way back in 1992 itself, she aslso has to her credit the Filmfare Lifetime Achievement Award. On this birthday, our hearty wishes to you to reach greater laurels.